With a Cheerful Heart: What if? Two weeks between posts. Ughh. I know--it's less dry spell, more drought. I have started no less than half a dozen posts on various notepads I keep around the house. I write them as I wash the dishes, rock my babe to sleep, sort the laundry. And although my scribbled notes assure my thoughts don't vanish, they hardly do much to share them either. In an attempt to get this derailed blog permanently back on track, I've decided to revisit my here, there, and everywhere notes and put them in ink (so to speak) here in this catchall cyber space of mine. Let's start with this one. I'm training for a marathon--did I already tell you that? It will be my second. My first foray into the world of absurd tests of endurance was the 2007 Salt Lake Marathon. The race may have come too early in my running career--just 10 months after I laced up a pair of running shoes for the first time--or I may have just underestimated the time it took me to cover the distance while training. Personally, I think my downfall was a wicked sinus infection that had my face feeling more like the morning after of a fist fight than sickness, but that first marathon did not go as planned. It wasn't that my time was particularly bad. I think it was around 4 hours and 26 minutes. It wasn't even that it required medical attention and mild sedation to fix my mangled feet following the run. It was the simple fact that the race was just not as fun as I'd hoped it would be. I remember crossing the finish line feeling relieved, but not satisfied. I thought, "Huh, I think I'm going to have to try that again." Two years and one more child later, I'm ready to do it again. And somehow, this time already feels more fun. The feelings of fun might be the fact that the St. George Marathon boasts about 9,000 more runners than my previous 26.2. I love running with/by/along side people. I think about their stories, their clothes, their reasons for devoting hours and hours and hours to the practice, discipline and sport of running. I think about their bodies--shaped, molded, sculpted by running. If I'm being honest, I think about their thighs and whether or not mine should be moving faster than theirs. It's semi competitive, semi voyeuristic, semi crisis-of-self-confidence meets motivation-by-any-means-necessary. Sometimes, you've simply got to draw the strength from wherever you can find it in the moment. I love the crowds of family that come to support other runners. I love their clever signs, their adoring children. I love the aid stations set up every few miles. Their carefully filled cups of water and Gatorade all in a row. I love the cheerful race volunteers, the sound of the paper cups crashing to the pavement to become part of the confetti that lines the race route for yards after each aid station. Yes--I run to be part of the party. I spent almost all of last week in Boston for a conference. It was a busy week that took nearly as much coordination to keep my family running in my absence as the conference itself. (Note to self--five nights away from my babies is too long right now. Oh, how I missed their angel soft cheeks and smelly little mitts.) Although I was in the city for work, I woke early for a little running pleasure. The mornings were beautiful as I wound my way through the streets of this most historic city. First up from the harbor to Boston Commons, through Beacon Hill and then along the Charles River. 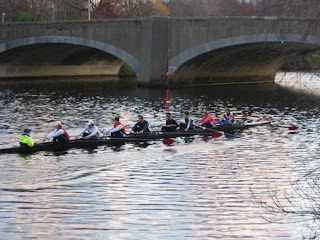 The route had a thriving community of runners, each keeping their own pace alongside the teams of rowers methodically urging their vessels forward in the river beside us. It was peaceful, inspiring. I say inspiring because in order to qualify for the great race that is the Boston Marathon, I will need to finish my jaunt in St. George about 15-20 minutes faster than my practice runs translate into my projected finishing time. (In running, 15 minutes is a LOT of time to shave off your pace.) But my little run in Boston started me wondering, "What if?" What if I ran each mile just a bit faster? What if I pushed my body just a little harder? What if I could shave 46 minutes off of my first marathon time and claim the 3:40 time required for Boston? What if? What if I could do it all just a little over a year post-baby, post-surgeries, post-new outlook on everything in my life and all in a still sleep deprived state? What if? Of course it's okay (really, really okay) if I don't qualify to join the Boston race and its throng of 25,000 pavement pounders. First, I don't know if my body could handle the pace without some serious post-race repercussions. Second, it's been a long training season and quite frankly I'm just ready for the race to be here and done. That said, one cool, gray morning running along the Charles River may have been the only taste this runner needs to move my well-soled feet just a bit quicker. After all, the faster you run, the faster you're done, right? Honestly, if this year has taught me anything it's taught me to not be afraid to dream and plan and try. Here's to daring to entertain my what if's. What are yours? Holy Smokes! I consider it a huge feat that you are running consistently at all right now! I consider it a huge feat if I can even attempt to get the house clean, dinner on the table, and heaven forbid... try to exercise in the precious 20 minutes that Grant will nap for. I applaud your desires. Here's to a year of What If's becoming reality! Go Mindi! You have inspired me to run, so I know you will do awesome!! What if I could EVER run two miles without feeling like I was going to die?! How do you do it? You didn't have enough fun in your first marathon? Does anyone have fun doing that? You look fantastic, you are super mom and you inspire me all of the time! Good luck with your race! Running, in my opinion, never equals fun. Perhaps if I could do it for more than three minutes at a time I could change my tune. You're awesome! I'm so inspired by your running and all the other runners that surround me. My dad was a runner and I've always thought someday I could be like him, in that regard. Hearing about your running helps me get out the door in the morning and do my (for now) walk around the path and hopefully soon my run. I am SO proud of you...and if anyone can put their mind to something and accomplish it..its you!! Shane is looking forward to running with you on Saturday! He felt bad about this weekend but he baptized his niece on Saturday morning and we had a huge family shin-dig after at our place. Funny enough--he said to me the other night...Mindi and I are sticking together and the faster we run, the faster we get done! So I think you be pushing each other the whole race!! You both have the same idea...JUST RUN YOUR BEST AND GET IT OVER WITH! He is in Baltimore tonight and tomorrow but I know he wanted to get with you or at least talk to you before Thursday. When are you going down? I think we will leave Thursday night. Let me know. We will find you at the Expo on Friday! Once again, I LOVE reading your blog and I am SO glad your little McKay is doing well. Our little "Miracle Mason" in our ward is not doing well at all. When I talk to Summer (Mason's Mom), I can't help but think of you. These precious babies..each case SO different, yet their little fighting spirits are all the same! I look forward to seeing you this weekend!